Aristotle was born in 384 b.c., in Stagira, Greece. He achieved prominence as an eminent philosopher who greatly influenced the basic principles of philosophy and whose ideologies are still practiced today. Aristotle was a student of the renowned philosopher Plato and tutored Alexander the Great, who became King of Macedonia in 336 b.c. Aristotle established his own school in the Lyceum, near Athens, in 335 b.c. He often lectured his students in the portico, or walking place, of the Lyceum. The school was subsequently called Peripatetic, after the Greek word peripatos for "walking place." In 323 b.c. the reign of Alexander ended with his death, and Aristotle sought refuge at Chalcis. Aristotle formulated numerous beliefs about the reasoning power of humans and the essence of being. He stressed the importance of nature and instructed his pupils to closely study natural phenomena. When teaching science, he believed that all ideas must be supported by explanations based upon facts. Concerning the realm of politics, Aristotle propounded that humans are inherently political and demonstrate an essential part of their humanity when participating in civic affairs. Philosophy was a subject of great interest to Aristotle, and he theorized that philosophy was the foundation of the ability to understand the basic axioms that comprise knowledge. 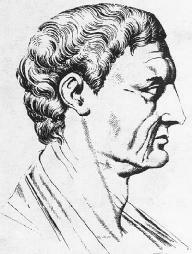 In order to study and question completely, Aristotle viewed logic as the basic means of reasoning. To think logically, one had to apply the syllogism, which was a form of thought comprised of two premises that led to a conclusion; Aristotle taught that this form can be applied to all logical reasoning. To understand reality, Aristotle theorized that it must be categorized as substance, quality, quantity, relation, determination in time and space, action, passion or passivity, position, and condition. To know and understand the reality of an object required an explanation of its material cause, which is why it exists or its composition; its formal cause, or its design; its efficient cause, or its creator; and its final cause, or its reason for being. Aristotle agreed with his mentor, Plato, concerning the field of ethics. The goodness of a being depended upon the extent to which that being achieved its highest potential. For humans, the ultimate good is the continual use and development of their reasoning powers to fullest capacity. To effect fulfillment and contentment, humans must follow a life of contemplation, rather than pleasure. The fundamental source of Aristotle's theories were his lectures to his students, which were compiled into several volumes. They include Organum, which discusses logic; Physics; Metaphysics; De Anima, concerning the soul; Rhetoric; Politics; Nichomachean Ethics and Eudemian Ethics, involving principles of conduct; and De Poetica, or poetics. He also wrote Constitution of Athens, a description of the foundations of the government of Athens. The work was discovered in the late nineteenth century. Aristotle died in 322 b.c., in Chalcis, Greece. Just surf over to the Aristole ISP's July 4 website, where you can compose your own pyrotechnics firework display over seven American skylines, from San Francisco to New York, using Shockwave Flash. He also won acclaim and awards for playing C S Lewis in the moving TV version of Shadowlands and also appeared in Tinker, Tailor, Soldier, Spy and as Aristole Onassis in A Woman Named Jackie. Other possible influences on this description are identified, and it is suggested that the Beowulf passages may be based on the Letter of Alexander to Aristole and the Visio S.
The supposed connection between orality and truth can be traced back to Plato and Aristole.